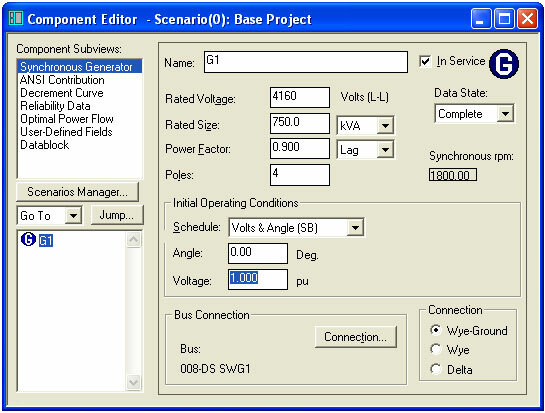 There is a general misconception that the initial voltage defined for a utility or a swing bus generator is the pre-fault voltage at the connected bus. The initial voltage is actually the internal voltage before the source impedance. For the swing bus generator (G1) below, the initial voltage is the voltage of the source before the voltage drop across its internal impedance. If the short circuit study setup has the No Load With Tap option selected, this initial voltage is used to calculate the pre-fault voltage at the source bus and other buses in the system. Additionally, if there are any transformers with tap settings between the swing bus and the location of the fault, the tap percentages will change the pre-fault voltage on the secondary side of the transformers. If the Load Flow Voltage or User-defined bus voltages are used as the pre-fault voltage option, the load flow results or user-define values will be used as the pre-fault voltage at the buses.